A key hub on the peninsula, Kircubbin has a rich history encompassing agriculture, industry and seafaring. Stop off to stretch your legs and enjoy the outstanding location mid-way along the west coast of the Ards. Walking trails take you on a journey through the countryside, revealing hidden historic gems and stunning views across Strangford Lough to the distant Mourne Mountains. The 40 Steps walking trail - a beautiful walking trail that takes you through rolling landscape with dramatic views of the lough and beyond. Castle Hill, Ardkeen - one of the best kept secrets on the Ards, this site includes a fine example of a Bronze Age double-ditch hill fort, which was subsequently developed by John de Courcey as a principle Norman castle. Once the seat of the Kings of the Ards, then the site of Caput of Mensal Manor for the Earls of Ulster, this elevated site enjoys spectacular views across the length and breadth of Stangford Lough, and peeping over the Ards as far as the Isle of Man and Scotland. Over the hill, as the tide goes out it drops over a rock shelf at the narrowest point, creating a unique tidal waterfall with a drop of about four feet. There is no car parking, and access is right-of-way across private land, so please observe the country code, control your dog, and respect landowner's property. Echlinville Distillery - The Echlinville Distillery became Northern Irelands first licensed distillery in over 125 years distilling its first spirit in 2013. Their Ethos: “We will not compromise in our desire to produce the finest whiskey conceivable. We will give it authenticity and provenance. It will tell the story of the land from which it originates, and of those who brought it to life.” The extraordinary new still house is not only a functional space for production but can easily lend itself to entertaining guests and our tours can offer a real insight into the workings of an operational distillery. Also worth seeing while you are visiting the distillery is the private collection of military hardware, including main battle tanks, armoured personnel carriers, and much more. Horse Island - this is a stunning wildlife conservation area, accessible at low tide (bring your wellies), offering a wealth of flora and fauna to discover, as well as spectacular panoramic views of the lough. Location: about two miles south of Kircubbin, just before a bend in the road before a builder's suppliers. Inishargy Church of Ireland, Balligan - This church was built in 1704 to serve the needs of the parishes of Ballyhalbert, Ballywalter and Inishargy since the churches of the two former were in poor repair and old Inishargy church had been in ruins for many years. It served the whole area till the 1843-50 period when new churches were built for Ballyhalbert and Ballywalter and a new parish was created at Kircubbin. Inishargy church then decayed until 1966 when a careful restoration was undertaken. The church registers survive dating from 1783. The graveyard is very tidy but only contains eight gravestones. The oldest stone dates from 1802 and four are included in Memorials of the Dead, VII, pp 19-20. A brass tablet on the west wall of the church commemorates the Priory of Saint Andrew of the Ards (commonly called the Black Abbey) founded circa 1200 AD for the brethren of the Order of St Benedict to which this church was appropriate. The Priory was disolved after the Order issued in the 33rd year of the reign of King Henry VIII and this church was rebuilt in the year 1704 AD. Inishargy House - originally an eccesiastical site, this is a a hill site that was once surrounded by a large lake; the ruins were rebuilt as a house in 1628 and the lake drained. It is now a private residence/farm, and the remains of the old church and a couple of old headstones remain. Location: about half-a-mile north of Kircubbin, turn up the Inishargy Road at the chapel. Access: Private property (ask permission from the landowner). 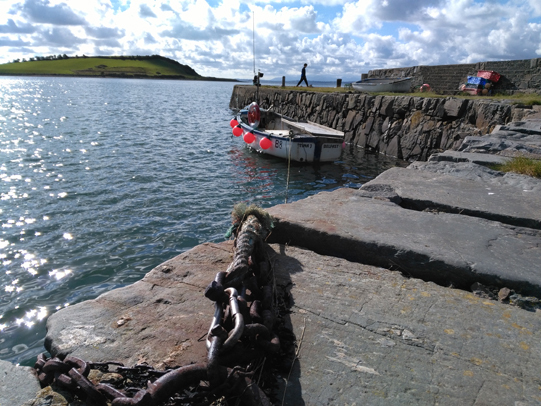 Kircubbin Sailing Club - if you are visiting Strangford Lough by boat, this is the ideal mooring destination with the only deep water close to shore on the west coast of the peninsula. Location: sail/paddle/motor into Kircubbin Bay, and the yacht club is just to the north of the village. Access: by sea, remember to bring your boat; by land, a private road leads to the yatch club from the shore car park just to the north of the village. Location: on the shore-side of the village - it's the hill on the headland on the far side of the playing fields. Access: Right-of-way access only - please respect the landowner's property. Saltwater Brig - 17th Century bridge, still in constant use as part of the main A20 route south; this little bridge once marked the border seperating the Greater Ards (to the north) and the Little Ards (to the south). Excellent views of the lough from the bridge, or pub gardens nearby. Location of bridge and adjacent chapel have been used for TV and film-making. Location: About three mile south of Kircubbin - it's the little bridge!